Arc Surveying & Mapping, Inc. provides geophysical surveys that have revolutionized dredging by generating detailed models of the subsurface utilizing an electrical resistivity system and software developed by Aquares, NV. A geophysical survey of the subsurface is performed simultaneously with a bathymetric survey, providing a detailed four-dimensional georeferenced model illustrating the latitude, longitude, elevation and Ohmm value of each subsurface material change. Ohmm values (strength of resistance) are identified on a color scale bar ranging from grey (soft) to red (firm/hard) for quick visual recognition of areas of concern. Arc/Aquares 4D geophysical models permit engineers, designers, geologists, dredgers and planners to choose the locations and minimize the number of borings necessary to accurately describe the subsurface. The Arc/Aquares geophysical method of identifying subsurface conditions is in use worldwide and provides a common sense approach to preparing for your next sand search, port deepening, and maintenance dredging or environmental remediation project. Below are samples of projects in New York Harbor, the Delaware River, Jacksonville, Cape Canaveral, Miami, Florida, the Indian River Lagoon, Rockledge, Florida and world wide locations. As different rock types were known to exist on the Delaware river including harder quartz gneisses and softer biotite gneisses, an intensive drilling campaing was performed by the Corps of Engineers to map the different rock types and sedimentary structures. After realising a large number of boreholes and CPT’s no clear information was available allowing to calculate rock and sediment volumes. 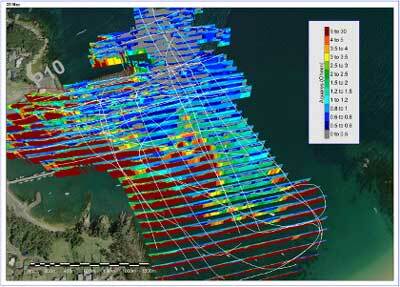 An Aquares resistivity survey was organised resulting in a complete 4D model of the river sections to be dredged. The example shown above shows a typical vertical resistivity section of the survey area. It shows a rock basement consisting of vertically layered gneisses overlain – in the deeper areas - by gravel, sand, silt and clay sediments. The resistivity results clearly distinguish between the gravel, sand, silt, clay as well as the different gneiss types, harder quartz gneisses being associated with very high resistivity values (> 400 Ohmm) while the softer biotite gneisses are associated with lower resistivity values. Based on this information additional boreholes positions were selected to confirm above geophysical findings before tendering the project with accurate sediment, hard and soft rock volume estimates. The Indian river in Florida is known to contain large volumes of muck with contaminants of nitrogen and phosphorus which, from time to time, tend to cause massive fish kills in the area. Local county councils have reserved large budgets to clean up the contaminated muck and have tried several methodologies to locate and quantify the contaminated mud volumes. Recently it was decided to test the capabilities of the Aquares resistivity method to explore the contaminated muds. A number of survey lines were run along a large number of probe locations. The picture above shows the results of these vertical profiles. An georeferenced 4D resistivity model was constructed of the entire survey area allowing to present the resistivity in a number of horizontal sections at different penetration levels relative to seabed level. The next picture shows some of these horizontal resistivity sections at 1, 3 and 8 ft below seabed level. While higher resistivity values appear to correlate with sandy sediments the lowest resistivity values in the channel along the eastern reaches of the survey area show a good correlation with the deeper penetrated probe locations marking the presence of contaminated muck. Based on this type of information the horizontal and vertical extent of the muck deposits can be defined and sampled with a limited number of well-chosen vibrocore locations. Muck volumes can be calculated and an economically justified dredge plan can be worked out. After a previous deepening program in the Kill van Kull in New York down to -40 ft using drilling and blasting methods, an additional deepening campaign was planned down to -45 ft. The question was to define whether additional drilling would be required for this deepening phase or if the previous operations had the rock sufficiently fractured to remove it with a backhoe. The geology consists of a very compact diabase (the Palisades sill) with shale intercalations in some areas. A detailed Aquares resistivity survey was carried out in the area resulting in a georeferenced 4D resistivity model of the entire site. The picture above shows a typical vertical resistivity section derived from this 4D model. This section shows a low resistivity top layer correlating with fractured rock overlying a very high resistivity structure correlating with compact rock. As most of the compact rock is situated below the -45 ft dredge level this project was expected to be realisable using a backhoe without the need for additional drilling and blasting. Only the high resistivity peak along the left edge of the vertical profile suggests a more difficult dredge area as was later confirmed during the dredging operations. Two multinational construction companies interested in building an aluminium plant and a hydroelectric power station in a mangrove swamp on an island near Papua New Guinea decided to carry out an extensive classical soil investigation around the island to find suitable sand for reclamation purposes. Various geophysical and geotechnical surveys were realized involving seismics, sidescan sonar, multibeam bathymetry, 77 vibocores and 116 boreholes. As the geophysical results were of poor quality the vibrocores and boreholes were randomly placed. After 2 years of investigations worth 12 million dollar, the final report concluded that no significant volumes of sand were available. The consultants then decided to carry out an Aquares resistivity survey hoping to get a better geological understanding of the site using an integrated 3D ground model. 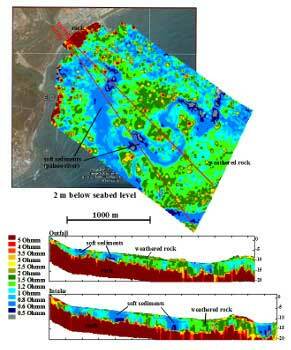 After 10 days of survey work the resistivity results showed the location of more than 200 million m3 of sand deposits. Moreover, the resistivity results also showed the projected navigation channel leading to the island to be cutting a number of rocky areas (see figure). 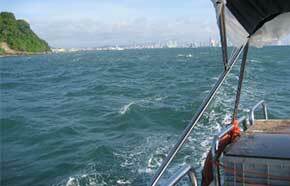 By changing the design of this channel shifting it about 300 m to the east very expensive dredging costs were avoided. Cost savings based on resistivity results have been estimated at more than 1000 times the survey costs. In Limbe, Cameroon the decision was taken to build a port for the maintenance of offshore oil drilling platforms. In a first instance the port was designed and tendered without any detailed previous knowledge of the geological characteristics of the construction site. A marine construction company bidding for this project and understanding the importance of the lack of geological information with regards to their cost estimates, decided to work out an integrated 4D groundmodel based on Aquares resistivity measurements. A complete 4D model of the construction site was generated based on the resistivity results completed with boreholes. The picture shows a number of horizontal resistivity sections at -10, -12 and -16 m relative to chart datum as well as a vertical section showing the thicknesses of some of the geological structures. The construction site consists of solid basalt overlain by weathered basalt and fine to coarse sediments as confirmed by a limited number of boreholes. Based on the original design it appeared that dredging operations and construction of the quaywall would be extremely expensive due to the presence of very hard solid basalt. After some calculations and various communications with the client’s consultants, it then was decided to modify the design to take advantage of the location of the solid basalt for the foundation of the quaywalls and softer rock and sediments for the turning basin and rehandling pit. By adjusting port design to the geological conditions as defined in the integrated digital 4D ground model it was estimated that more than 50% of the construction costs were saved. A company specialised in port operations and logistics planned to build a new port in a mangrove swamp in Buenaventura, Colombia. 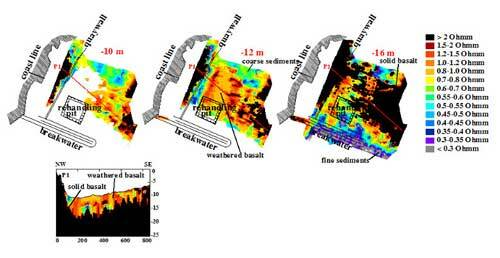 In order to be able to correctly and economically design quaywalls, turning basins and other infrastructure they decided a detailed integrated 4D ground model was required based on Aquares resistivity information. low resistivity values (blue) correlate with muddy sediments as confirmed by boreholes. Based on this type of sections dredge volumes of sediment and rock can be calculated for the turning basin north of the existing ship channel and quaywalls can be designed south of the ship channel based on accurately known rock head levels. 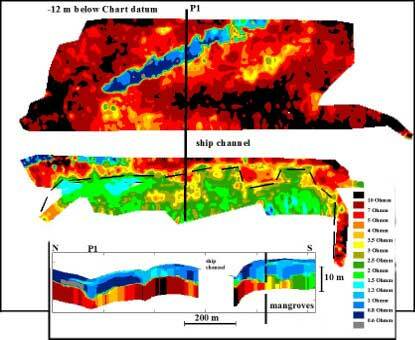 Interestingly, the horizontal as well as the vertical section both show differentresistivity values for the rock heads underlying the mangroves (green-yellow: 1.5-3.5 Ohmm) as compared to rock head resistivity values (red: >5 Ohmm) underlying open water north of the ship channel. This phenomenon is most likely associated with low pH values in mangrove areas caused by sulphate concentrations generated by the decomposition of biologic tissue of marine animal life living in the mangrove swamp. If no appropriate precautions are taken during dredging operations, this potential acid sulphate hazard may become an accute menace to the existence of marine life in the surrounding area. 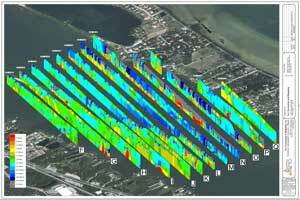 It is obvious that without the application of high quality geophysics presented in a 4D ground model these potential environmental hazards most likely would have been detected only during execution of the project when actually unleashed by the dredging operations. The Eden Port Development project was a $25 million port construction project managed by NSW Trade and Investments (Crown Lands) in New South Wales, Australia, involving the extension of an existing breakwater, quaywalls and mooring dolphins, associated dredging operations and a fixed or floating wave attenuator. Originally the port design was based on a detailed site investigation including a classical seismic reflection survey, a side scan sonar survey, magnetometer survey, 21 boreholes and 15 vibrocores. Crown Lands then decided to carry out an additional site investigation integrating all existing information into a 4D ground model based on Aquares resistivity results to help mitigate latent geological risks specific to the project. The picture shows some of the results presented using the Encom PA software package. They clearly show the extent and thickness of high resistivity rock heads and gravels. Significant differences were noted between the seismic results and the high quality resistivity (Aquares) results. The use of an Aquares based integrated 4D ground model on this specific project has led to an estimated 20% savings in dredging and piling costs. A construction company contracted to build a power plant along the coast in Ghana was required to include an intake and outfall for cooling water of the power plant. The intake and outfall tunnels were to be drilled horizontally at about 10 m depth starting from the beach. As drilling tunnels should be done in solid rock while the retrieval of the drilling equipment can more easily be done in softer sediments where a simple hopper suction dredge would be capable to uncover the drilling equipment, the construction needed good geological information to optimize the tunnel routes. As the classical seismic and borehole information provided by the client where largely insufficient for the purpose they ordered an Aquares resistivity survey to generate a georeferenced 4D integrated ground model of the construction site subsurface. The vertical resistivity sections generated across the 4D model clearly shows sold rock heads (high resistivity values) covered by weathered rock (intermediate resistivity values) and soft sediments (low resistivity values). 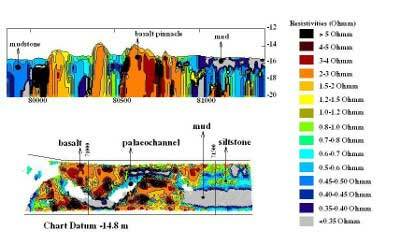 The horizontal resistivity section at 2 m below seabed level shows the position and extent of a palaeoriver system filled with low resistivity soft sediments meandering in between solid and weathered rock heads. Based on high quality resistivity information combined with borehole and other geotechnical information into a georeferenced integrated 4D ground model, the tunnel routes could be optimized saving millions of dollars in drilling and dredging costs. By focussing the dredging operations on the more promising geological structures as mapped in the 4D resistivity model, the productivity of the mining operations were significantly increased. After a detailed site investigation involving a number of classical geophysical surveys and a borehole campaign, ACP (Autoridad del Canal de Panama) tendered a dredging project in the access channel leading to the Miraflores locks. A group of dredging companies interested in the project realised an additional investigation including an Aquares based integrated 4D ground model. Some of the results are shown in the horizontal and vertical resistivity section of the picture shown. The vertical section shows the location and extent of hard basalt rock, softer mudstones and soft mud. 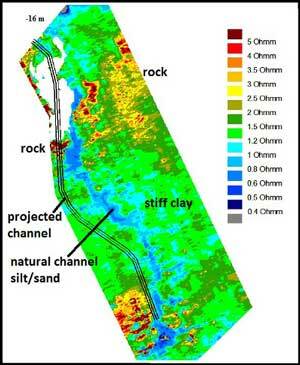 The horizontal section shows the lateral extent of the geological formation at dredge level. It clearly shows a natural palaechannel cut into basalt rock by the Rio Chagres in his course from Lake Gatun to the Pacific Ocean in geological times when Pacific sealevels were far lower than they are now. This type of high quality geophysical information complemented with a limited number of well targeted boreholes allowed the dredging contractor to accurately calculate the geological risks. As a consequence, this dredging project was awarded at only 30% of the original budget estimate suggested by ACP in the tender documents based on their own site investigation excluding advanced geophysics (Aquares) based integrated 4D ground modelling.